We have viewed the unfolding violence in eastern Ukraine on our TV screens as a humanitarian disaster in the making. An estimated three quarters of a million Ukrainians have fled across the border into Russia, many living in tents in 95 temporary refugee camps. A further 175,000 are said to be displaced westward into Ukraine. Economically, the damage to Ukraine will take much longer to evaluate. For the steel and coal industries, the situation is deteriorating as the conflict intensifies. This week Reuters reported that after months of fighting, extensive damage has been sustained to the infrastructure of Ukraine’s industrial heartland and considerable disruption to supply networks, leading to a 12% year-on-year fall in industrial output in July. Last week, it emerged that around half of the 115 coalmines in Ukraine, Europe’s second-largest coal producer, had halted production entirely. Shelling of power stations and transmission lines has halted production at Avdiivka coke plant, which produces 40% of Ukraine’s coke. The same loss of power has led to the full shut down of production at Yenakiieve Steel, a leading producer of steel billet. Enakievskiy Koksohimprom and Khartsyzsk Pipe is one of Europe’s largest large-diameter pipe mills according to the owners Metinvest. Metinvest controls about 50% of Ukraine’s steel market and steel makes up about 15% of the Ukrainian economy, which last year was the fifth-largest exporter in the world, according to a separate Reuters report. Tensions in eastern Ukraine have led to outright production disruptions as the year has gone on resulting in a 7% fall in output in the first half of 2014. Not surprisingly, exports to Russia have been particularly badly hit, down 38% in the first four months of the year. Ukraine sold three quarters of its 32 million tons of production to export markets last year worth some $2.65 billion, so steel is a major source of export revenue for an economy on the brink of collapse, surviving on European loans. Overseas markets are unlikely to suffer significant price increases as a result, due to competition from cheap Chinese exports, although Platts reported Russian steel producers were attempting to raise prices in response to a drop in supply from Ukraine. Metinvest have closed their books to new orders as a result of the deteriorating situation and only the much smaller local ArcelorMittal operation, with plants in central Ukraine, is said to be increasing its exports by a minimal 2.4% quarter on quarter. 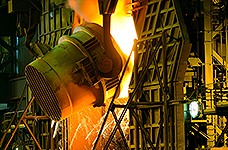 For the steel and coal market, excess capacity in Europe and further afield will keep the markets well supplied in spite of disruptions to Ukrainian supplies, but for Ukrainian producers, the physical damage to plants and the loss of long-term supply contracts to overseas customers will take much longer to repair. There seems little doubt the hardship caused by the tensions in eastern Ukraine is set to disrupt the wider economy with increasing severity as the year unfolds.